Adding Stephen Johns: The Stars made a big splash this summer to acquire Patrick Sharp, but they also added Johns in the process. Johns is a big shutdown defender and instantly becomes one of the team’s top prospects. The 2015 NHL Draft: Dallas went off the board when they selected Denis Gurianov at 12th overall, but the move is already starting to look like a very clever gamble on the franchise’s part. The Traverse City Roster: While the Stars didn’t have a particularly good tournament, finishing fifth out of eight teams, the team’s roster was stacked with top prospects, giving fans and organization alike an excellent chance to see what the kids could do. The top three players on the Stars Prospect List below have a strong chance of making the NHL and being impactful when they do. In addition, there will likely be others from these rankings who make the NHL, but they are either less likely to have an impact or less likely to make the NHL. Possessing five impact players is around the average amongst NHL teams. As for the rest of the league, the team with the most impact players is Winnipeg with 9 followed by Arizona and Detroit with 8 apiece. Los Angeles trails with just 1. One of the most surprising risers of the 2015 NHL Entry Draft, Gurianov was generally projected to get picked somewhere in the 20s but was instead scooped up by the Stars at 12th overall. General Manager Jim Nill and his staff clearly saw something special out of the young Russian, something that is starting to come further into the light. Gurianov is a tantalizing offensive weapon: big, fast, and aggressive. His shot is absolutely lethal, and he has both the physical tools and the mental smarts to get into the right positions to use it. He’ll be a very interesting player to watch for Russia at this winter’s World Juniors. 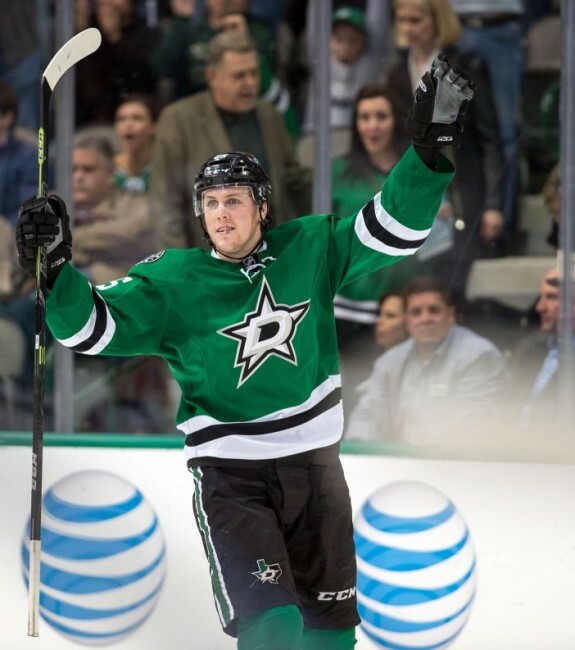 A hulking, imposing winger, Brett Ritchie is the epitome of the modern-day power forward. He doesn’t have the mean, bruising mentality of power forwards of yore, but has excellent offensive instincts and a very surprisingly effective two-way game. He’s an absolute monster in the cycle and can laser home pucks when he gets enough time and space on the rush. Pair him with a talented playmaker and the results will be obscene, as the Stars, who employ both Tyler Seguin and Jason Spezza, will soon find out. He might spend the bulk of this season in the AHL but will be have an impact at the NHL level in no time at all. Players like Julius Honka might be the future of NHL defensemen, and the Stars are investing a lot in this possibility. Built in the same vein as defenders like Erik Karlsson and teammate John Klingberg, Honka is a smart, silky-smooth, two-way blueliner. He doesn’t have the size to truly excel in a shutdown role, but he’s more than capable of defending his own zone by quickly retrieving pucks and using his superior on-ice vision to move them safely up the ice, by either executing a pinpoint pass or skating them out of trouble. Honka is the type of player that is a magician at puck possession, night in and night out. Always a danger offensively, especially with his seeing-eye slapshot from the point, which he consistently threads through the bodies in front of him. Dickinson is the type of smart, versatile two-way player that all 30 NHL teams would love to have in their organization. His skating is at an elite level, his size is ideal to play against men, and he possesses great instincts at both ends of the ice. While he has the ability to contribute offensively it might be his defensive game that becomes his true calling card, as he was voted the best defensive forward in the OHL’s Western Conference by a coaches poll last season. Will most likely spend this upcoming season in the AHL but he’s not far off from seeing the NHL. This past season was Esa Lindell’s coming out party, and the sky is the limit from here. Lindell has the size and awareness to be effective in his own zone, but combines that with the skill and willingness to chip in offensively as well. He has a cannon from the point that he gets off with speed and accuracy, making him a great addition to any powerplay. He was given the Pekka Rautakallio Award as The Liiga’s top defenseman last year despite being only 20 years old for most of the season, and then followed that up by having a standout performance for Finland at the World Championships. Looks like he’ll become another steal by the Stars outside the first two rounds of the draft. Patrick Sharp was the main focal point of a blockbuster trade between the Stars and the Chicago Blackhawks this summer, but Stephen Johns has the potential to end up being the biggest difference-maker out of all the pieces that were involved. Johns is a big, physical shutdown defenseman that is showing no signs of slowing down in his development after a tremendous year in the AHL, where he led the league in plus-minus at a +30. His mobility is quite impressive for a player of his stature, and he’s steadily adding more and more of an offensive element to his game. He’s probably NHL-ready at this point, but with a deep blueline group ahead of him in Dallas he’ll be given another year to marinate in the AHL. It’s been a difficult couple of years for Jamie Oleksiak, but that doesn’t mean that he doesn’t possess a ton of potential. The mammoth defender was faced with mammoth expectations after being drafted 14th overall in the 2011 NHL Entry Draft and has had trouble living up to them in the following years. Luckily for him, however, his development has stayed mostly on track and he’s going to be up in Dallas full time this season. Much like Tyler Myers of the Winnipeg Jets, Oleksiak moves with an almost impossible fluidity for a player of his size and loves to jump into the rush offensively. Has all the physical tools in the world to be a dominant hockey player, he just needs to keep learning how to use them. His stats might not fly off the screen, but those that follow the Dallas Stars prospects closely know that Devin Shore is a very special hockey player. Hands-down the best player on his NCAA club the past two seasons, Shore is a determined, efficient center that plays a complete 200-foot game. He can bull his way around the offensive zone in the cycle or fly in open ice on the rush, and is well-positioned and relentless on the defensive side of the puck. He can do a little bit of everything, which will make him a favourite of Lindy Ruff and the rest of the Stars coaching staff. A big, mobile, two-way player…wait, where have we heard that before? The Stars have made no secrets about the type of player that they prefer, so it made perfect sense that they took Roope Hintz in the second round of the 2015 NHL Entry Draft. Hintz centered the top line for Finland at the 2015 World Juniors and could very well find himself in that same role again at this year’s tournament. He will get plenty of time to develop in his home country before the Stars decide to bring him over to North America. One player that doesn’t fit the Stars’ aforementioned preferred mold, however, is winger Cole Ully, and that’s totally fine with Dallas as Ully is dominant at the type of style that he plays. He’s small in stature, but other than that he’s a potent offensive weapon that is equally good at skating, passing and shooting. He racked up a ton of points the last two seasons despite playing on a woeful Kamloops Blazers team, so it will be fascinating to see what he can do with better linemates on the Texas Stars. He has made a great impression over the past few weeks at the Traverse City Prospects Tournament and now the Stars’ training camp.